Unless you’ve been ignoring your friends on Facebook and Twitter for some reason, you’re probably aware that yesterday was Star Wars Day, a holiday that emerged because people love saying “May the fourth be with you.” Silly, I know. 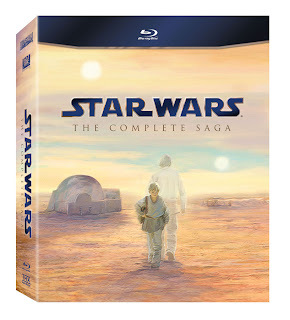 Giving fans more reason to celebrate on this bizarre occasion, StarWars.com posted a detailed breakdown of what we can all expect from Star Wars: The Complete Saga, the nine-disc Blu-ray collection of all six live-action Star Wars films that hits North American shelves on Sept. 16. The set will boast more than 40 hours of extended and deleted scenes, cast and crew interviews and documentaries covering just about every aspect of the films and the fandom surrounding them. It should be noted, however, that Lucasfilm does not state whether the original theatrical releases will be included on this set, so if you want to witness the original “Yub Nub” Ewok celebration sequence in high-definition, you’re probably outta luck…for now at least. To check out the specifics of this Blu-ray release, click here.